Property Owners: List your Picardy property on the premier site specialising in French holiday lets. More Info. View all gites and villas in Picardy. If you’re looking for a break that permits you to mix with real French people in a real situation, try a gite holiday. Gites in Picardy are well known for their quality, and they enable the tourist to relax and holiday in comfort. Alternatively, take a look at Picardy villas. They’re an excellent alternative, not only being well appointed, but also conveniently situated to enable you to get the most from your stay in the region. battles, in particular the Battle of Crécy and the Battle of the Somme. At Albert and Thiepval, you can visit monuments and sites dedicated to those who fought and died in the Great War. Although Somme has dark connotations, don’t miss a trip to the Bay of Somme, situated at the mouth of the River Somme. It’s a major wetlands area, known for its beauty, and is home to one of the best bird-watching sites in France. In fact, a veritable Twitcher’s paradise. 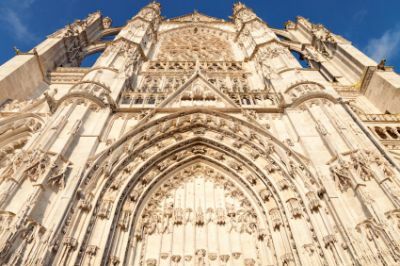 At Amiens, you can see an outstanding example of a medieval Gothic cathedral, the largest in France of its type, while over in Beauvais you can catch what was planned to be France’s greatest cathedral, but which was never completed. However, the part that was built is very striking. If you go to the Château de Chantilly, you’ll definitely be on to a winner. Not only does the château have its own museum, but it’s situated in magnificent parkland that contains the world-famous racecourse, Hippodrome de Chantilly, home of three major horse races in France, including the classic Prix du Jockey Club, which is run in June. Picardy is probably better known for its battlefields than its food. However, that doesn’t mean that it has little to offer. In fact, nothing could be further from the truth, and the adventurous traveller will discover all sorts of tastes and flavours designed to awaken the gustatory nerves. The duck paté from Amiens is a good place to start, as it establishes a firm foundation for any meal. Known as Pâté de Canard d’Amiens, or Pâté en Croute, it’s baked in a thick pastry crust. While the ingredients may vary slightly from place to place, as well as from the original recipe, as long as it’s still cooked in the traditional manner, you won’t be disappointed, especially if you accompany it with a bottle of full-bodied red wine. Another famous countryside speciality is Flamiche aux Poireaux, a very tasty pie made from leeks. It’s said to be Picardy’s equivalent of Quiche Lorraine, but whether or not that’s true, it makes a superbly satisfying feast. Picardy is also the birthplace of Crème Chantilly, another French classic. Originating from the town of Chantilly, in the seventeenth century, it’s now available all over the world, and can be found on or around the majority of desserts in this region. One more jewel in the Picardy gastronomic crown is Gâteau Battu, a cake that’s not unlike a brioche, but moister, and prized for its light airiness. Shaped like a chef’s hat, a slice goes down very well after a meal, especially with custard or some of the local rhubarb jam. View all villas and gites in Picardy.